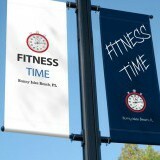 Fitness Time is dedicated to optimizing the member experience. Our goal is to motivate members to push harder, feel better and have more fun while doing it. Our staff is committed to establishing a community of long-term members who bond with our facility as well as each other on a level that extends far beyond fitness. We are always updating machines and take meticulous care of our equipment to provide a fitness haven where members feel welcome to celebrate their dedication to wellness. The Fitness Time concept is to inspire clients to surpass their goals and enjoy a healthy lifestyle in a body that reflects their commitment to fitness. Our facility has been thoughtfully designed to provide an upbeat ambiance that is accessible to all fitness levels. From the most intense fat blasting cardio session to a body trembling workout with weights to simply destressing, stretching and recharging; Fitness Time offers a multitude of options to address the diverse demands of discovering and maintaining your best self.